Published in Rafu Shimpo, August 13, 1955, Japanese and English sections. 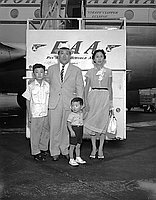 Shigeru Nakamura arrives with family at Airport for new post as Consul General of Japan for Los Angeles, California, August 12, 1955. Includes Mr. Nakamura standing with wife, Mitsuko, and two sons, Shigeki (13 years old) and Naoto (2 1/2 years old) on tarmac in front of Pan American Airways airplane; Mrs. Nakamura and son standing with six women standing on tarmac in front of airplane; Mr. Nakamura posing and shaking hands with men in suits. Typed on original envelope: Consul General Nakamura from Japan.